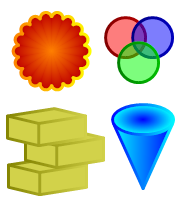 EZ Paint is a free alternative program to MS Paint for your Windows XP, Vista, 7 or 8 OS that has many of the same shortcuts and features. For instance, The left and right mouse buttons function the same way as in MS Paint with each button corresponding to one of the two available brushes. In addition, Control and Shift when used with the mouse provide the same stamp and trail functions as well. The arrow keys are used in a similar fashion to move selections in fine precise increments. Gradients are heavily utilized in web-page designs. In fact, it's almost impossible to find a web page where they are not used in some sort of fashion. The blend brush is used for gradient style fills in EZ Paint.